One of the great new features of the iPhone 3G S is its ability to record video, and the fact that it lets you trim the clips after you’ve recorded them. However, that’s where its native video editing capabilities end. Enter Video Edit, an application by Winnipeg developers DHI Inc. Video Edit allows you to easily cut together multiple clips, trim them inside the application, and render them to a new clip, which you can then send to YouTube, email, post on a blog, Facebook, Twitter et cetera. I got an early look at Video Edit and my experience with the application was good. The editing was quick, easy and the rendering time was fast, as promised. I found only a few shortcomings, which I’m sure will be addressed in later versions of the app. You can’t delete project files. Creating a project is easy enough, but when you’re finished rendering it, if there’s no further edits or additions to make, you’d think removing it from the project list would be an option. Not so. While every other part of the application operates in either portrait or landscape mode, the Camera Roll screen forces portrait mode. Uploading clips to YouTube or posting them to other sites must be done outside the application in the camera roll, after you’ve rendered the clip. I’d like to see an option to upload it inside the application directly following the render. Video Edit employs help overlays to get you started. It's so simple you barely need them. But that’s it – just three small gripes on an otherwise great application that fills a much-needed gap in the iPhone’s functionality. For more info on Video Edit visit www.videoeditapp.com. To be released June 2010. 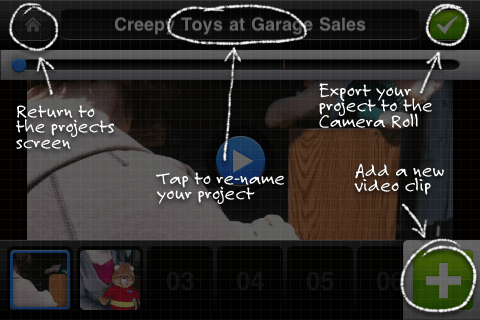 The creepy toys video looks intriguing! Share with the group? To delete a project file on the home screen just tap and hold for one sec on the project and then swipe to the right and a delete button will come up. It’s something we can maybe make more obvious in a future release. My suggestion is to use the iPhone convention of an Edit button that allows you to reorder and delete multiple objects at a time.